It’s nearly spring, but in many parts of the country there’s still a chill in the air and summer feels a long way off. 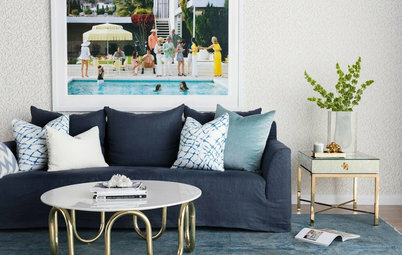 So now might be a great time to consider bringing a vacation vibe to your home — in the subtlest of ways, of course. 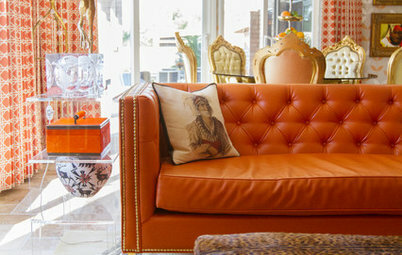 For me, there’s nothing more cheerful and summery than colors and accessories that evoke the tropics. 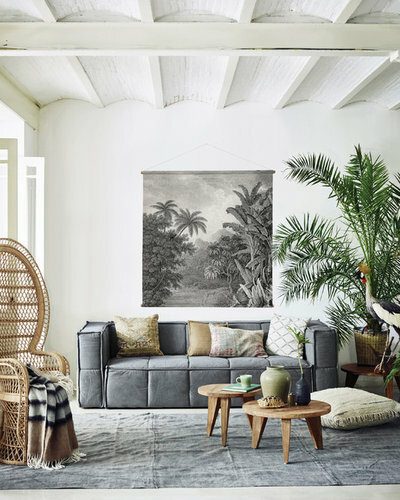 Going tropical with your decor doesn’t mean you have to paint several accent walls in vivid colors such as turquoise, tangerine or canary yellow. Nor do you need to trade in sleek furniture for wicker pieces. 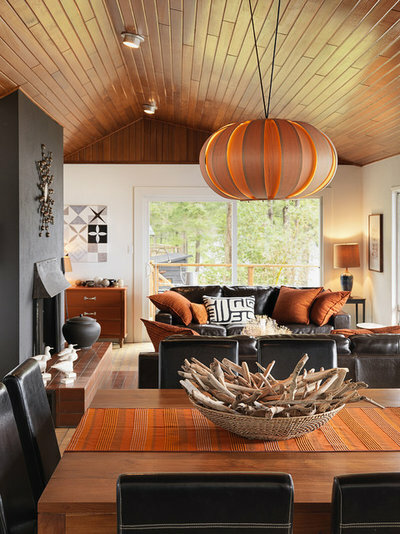 In fact, when it comes to adding a vacation vibe to your home, less is often more. 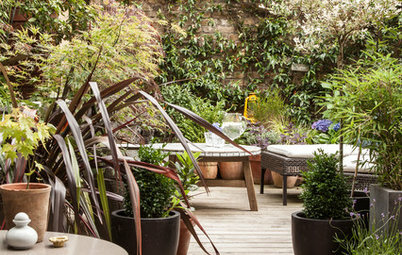 Here are seven ways to add a splash of the tropics to your existing design. Doing so can give your home a sunny vibe — and you an emotional boost — all year. 1. Swap out a light fixture. 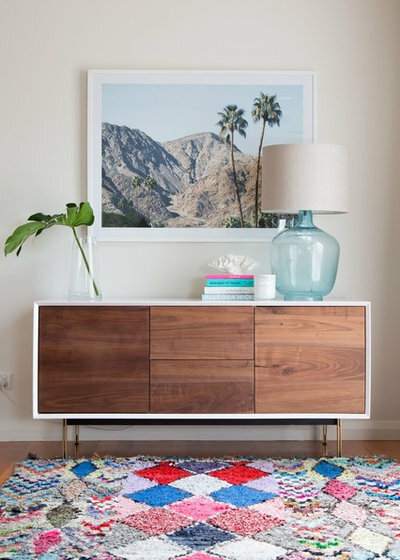 Swapping out a neutral light fixture for one with tropical character will instantly give your space a holiday vibe. 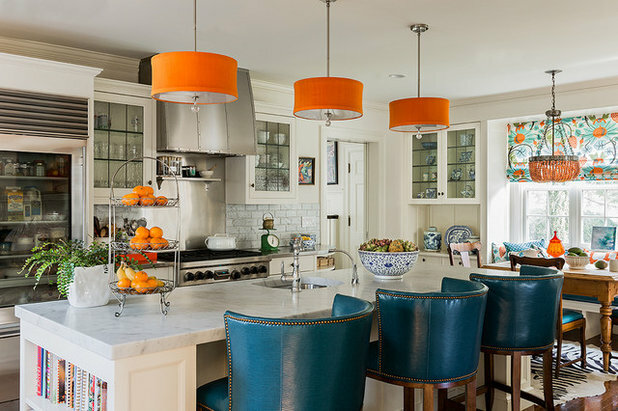 Look for one with organic-looking elements such as beads or capiz shells, or one in a fun Caribbean color such as coral, orange, aqua, fuchsia, turquoise or canary yellow. The eye-catching lighting will become a standout feature of the room. The beaded light fixtures are the star of this bedroom. 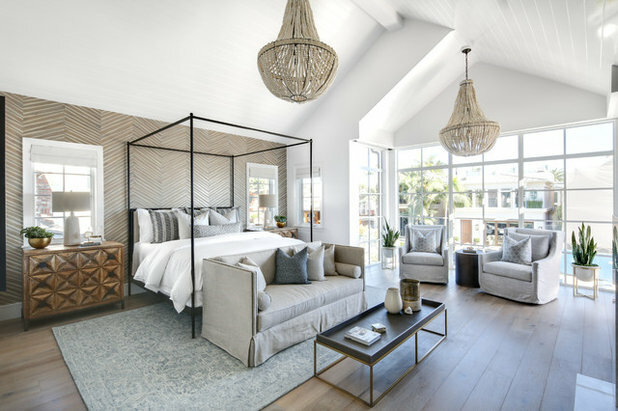 Their organic texture and shape add warmth and create an elegant, beachy feel, especially amid the straight lines of the architecture and furniture. 2. Add pillows and throws. 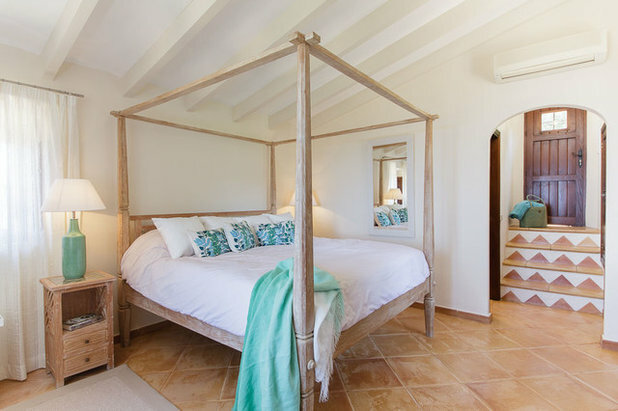 Accenting with tropical-colored pillows is a simple and often cost-effective way to amp up the vacation feel in a room. 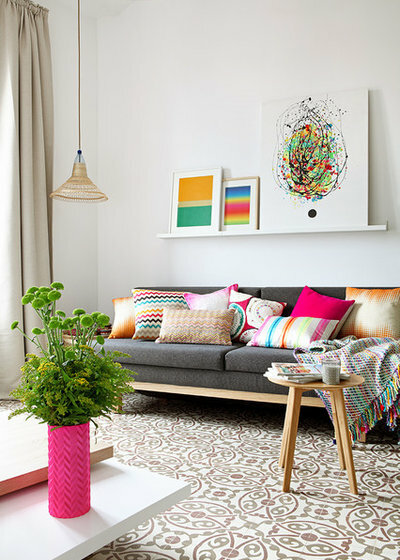 Try mixing colors such as turquoise and fuchsia, or layer with patterns in tropical colors, as was done in this cheery living room. This peaceful bedroom has a seaside feel thanks to the aqua throw pillows and blanket. 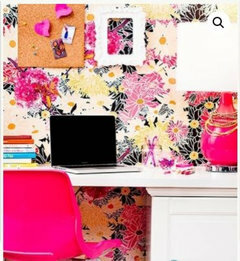 Adding tropical-colored textiles to your existing decor works especially well if you have a pale palette, as seen here. The bleached wood of the bed frame and nightstand evoke the seaside, although the finish could also feel rustic or farmhouse if different accent colors had been used. 3. Introduce botanicals, both freshly cut and in artwork. Leafy greens such as palm fronds and banana leaves can create an elegant, tropical feel in any room of the house. 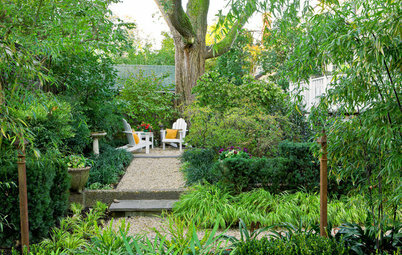 Go for a tall, lush plant or add just a subtle detail with a small vase holding your favorite tropical leaf. In this room, the plants nicely accent the artwork featuring tropical botanicals. 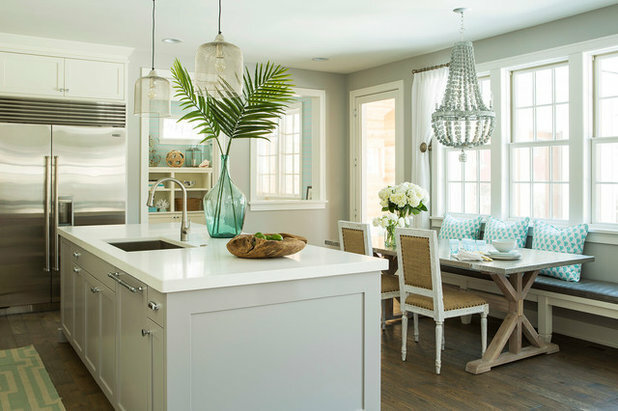 A vase of palm fronds helps give this light and airy kitchen its summery feel. Try layering a simple botanical with one other tropical accessory to make more of an impact. In this case, the beaded light fixture works with the fronds to create a beachy look. The aqua of the bench pillows and the vase also add a by-the-water feel. 4. Paint a door a tropical color. 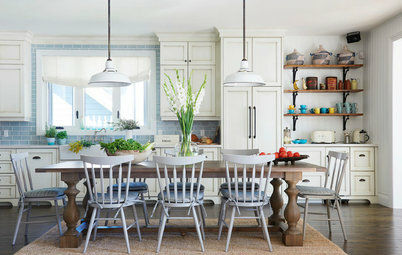 Painting an interior door a vibrant color can bring a happy, vacation-like energy to a space. This works particularly well when the surrounding walls are white or a pale neutral color, and when the door itself has some glass to offset the vivid color. 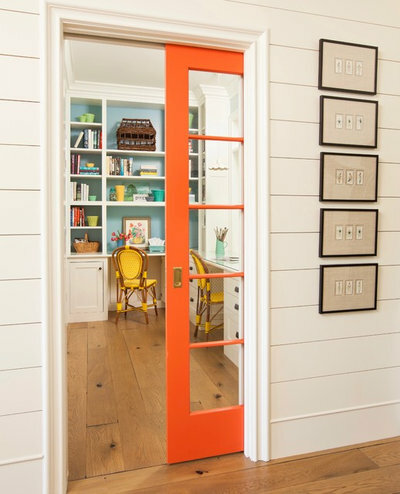 The rich orange of this pocket glass door makes the entrance to this home office feel fresh and exciting. The other Caribbean colors inside the office — aqua and yellow — enhance the sunny tone. 5. Sprinkle in beach accessories. Accessorizing with island-themed accessories can have a big impact, but this is definitely a case where the “less is more” rule I mentioned earlier comes into play. For example, placing a piece of coral or driftwood on top of a coffee table book will be eye-catching because of the coral’s organic shape and rough texture. 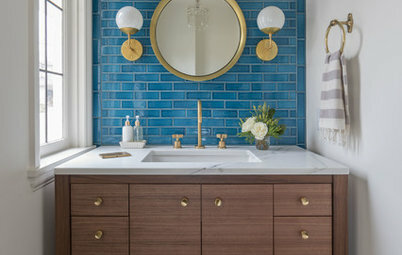 But be wary of using more than one ocean-themed accessory in the room, unless you’re decorating a seaside beach house and want to make an overarching statement. 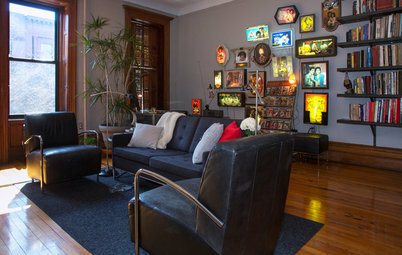 Otherwise, using too many of them can overwhelm the space and detract from the other lovely design aspects of the room. One or two accessories is usually enough to give a vacation-like vibe. Here, a piece of driftwood creates an elegant silhouette against a modern backdrop. 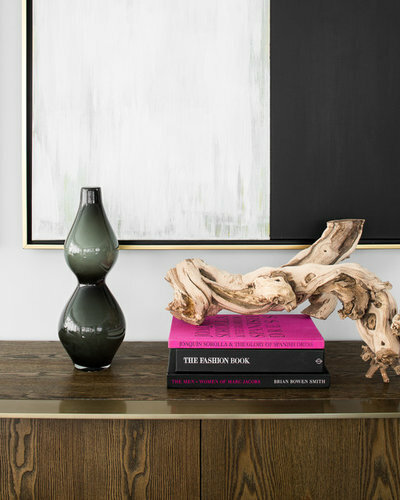 The natural shape and texture of the wood are in beautiful contrast to the straight lines of the art and the bulbous glass vase. The book in bright fuchsia adds an even more eye-catching island flavor. 6. Consider leafy wallpaper. For the more committed design enthusiast, a verdant jungle wallpaper pattern is an option for transforming an ordinary room into a tropical oasis. 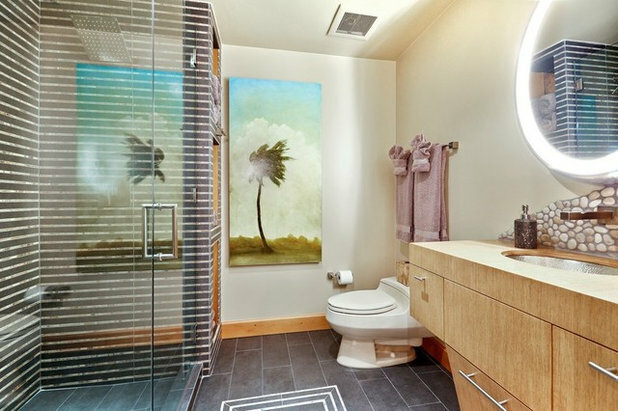 I recommend that this very bold, specific design statement be kept to a minimum — say, on a feature wall or in a small space such as a powder room or entry — so that it doesn’t feel overwhelming. The leafy wallpaper behind the bed sets the tone for a tropical-retreat feel in this room. The simple bedding, drapes and white furniture allow the organic-themed wall to be the elegant design statement. Along with placement, the subject matter and medium of the vacation-inspired art is important. In this terrific example, the image of palm trees and mountain doesn’t overwhelm the space, for two reasons. First, the photo’s faded colors give it a serene quality. 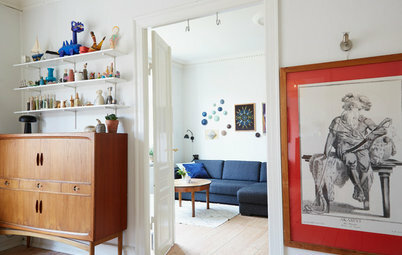 And second, its placement in a vignette, above a beautiful midcentury credenza with simple, clear accessories in the glass lamp and vase, allows the image to seamlessly blend into the space. 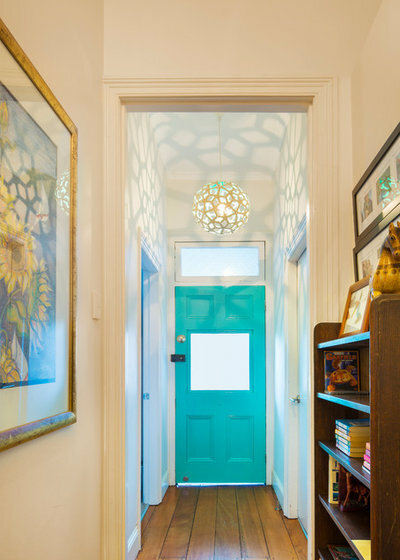 I'm always drawn to a fun pop of brightness on an interior door. Oh, I knew I'd adore this place - it's so juicy & welcoming & happy! Thanks!